Four decades ago, the first industrial use of lasers was for drilling through diamonds or wire draw dies. From that beginning the laser has become an integral part of the conventional technology in many production plants. In the forefront of that revolution has been the CO2 laser, today a varied and sophisticated tool. In the three decades since its introduction, the CO2 laser has become the workhorse of industrial lasers. Today it is available in a range of designs and sizes with output powers of 20 kW and more. Although the CO2 laser shares the industrial burden with the Nd:YAG laser, the two are used for different applications and processing methods. This division of labor is due partly to the different processing advantages each possesses and partly to tradition. CO2 lasers are used mainly for cutting, but welding applications hold the greatest potential for growth rates, thanks to the introduction of cost-efficient high-power beam sources capable of deeper penetration and higher processing speeds. In addition, barriers to the introduction of laser welding into selected industrial processes are falling by the wayside. CO2 lasers emit at 10.6 µm and have electrical efficiencies of approximately 10 to 15 percent. Their gas mixture consists mainly of helium to ensure the dissipation of heat but also contains carbon dioxide, the laser-active medium, and nitrogen, in which a gas discharge creates the energy necessary for excitation. In materials processing, heat dissipation (85 to 90 percent of the input electrical energy) usually is achieved with heat exchangers through which the gas is pumped via turbines, blowers or cross-flow fans. These lasers can be characterized as axial- and cross-flow types and by resonator geometry: single or multiple folding in a square or a triangle. For axial- and cross-flow lasers, a continuous supply of fresh gas is needed to maintain enough efficiency for optimum operation. No-flow lasers, in which the laser gas mix in the discharge cavity is cooled only by heat conduction methods, are used generally at relatively low powers. Figure 1. Principle of a CO2 laser. A diffusion-cooled high-power CO2 laser, the so-called slab laser, promises to replace flowing gas lasers in many applications because of a range of advantages offered by the basic design. The same design is used for low-power slab lasers, with the only difference being a sealed gas charge tube. A further classification reflects the type of energy input. In direct current (DC) lasers, the electrical energy is coupled with the gas directly by metal electrodes between which a gas discharge occurs. In axial-flow lasers, this discharge occurs in the direction of flow; in cross-flow lasers, it generally occurs perpendicular to the gas flow and to the resonator axis. DC lasers can be produced economically and achieve a comparatively high overall efficiency, making them the most economic choice for a large variety of applications. Another means of transferring electrical energy into the gas is radio frequency (RF). In most RF lasers, the discharge is perpendicular to the resonator axis. By modulating the power, such lasers can be regulated within a broad power range and pulsed with high repeatability. The disadvantage — reduced overall efficiency — is acceptable, especially for laser powers (>2 kW) for which the electrode wear of DC lasers results in increased service work. Older RF generators consist of an oscillator that generates the radio frequency and an amplifier tube. Modern generators are designed as self-oscillators and consist only of an RF amplifier tube. Because of their simplicity, compared with oscillator/amplifier generators, RF generators provide increased reliability with low maintenance and achieve higher excitation efficiencies with low operating costs. Resonator designs also are classified according to the type of beam path. If light can escape the cavity only through a partially transparent mirror, it is termed optically stable. If a resonator’s mirrors are totally reflective and it is geometrically designed so that light can escape past one of the mirrors, it is called optically unstable. 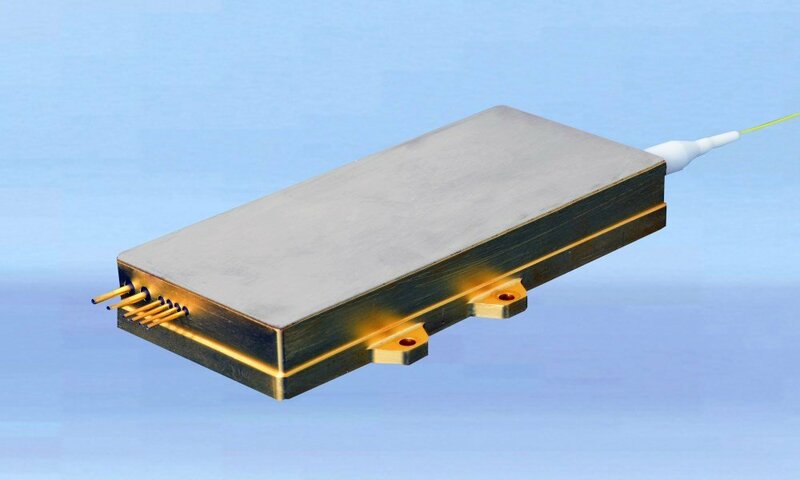 The thermal stability of optically stable resonators is limited by the thermal effects of the output mirror, particularly for high-power lasers with small beam diameters. In this case, unstable resonators can be used, but their sensitivity to misalignments can lead to a significant power loss. Because optically unstable resonators can be adapted easily to the geometry of the excited laser-active medium, this concept had been applied to the design of CO2 slab lasers. In combination with a thermally stable diamond window transmitting the beam through the resonator chamber, surface-cooled mirrors made of thermally conductive material guarantee high thermal stability even for the high beam intensities of the slab laser. Figure 2. Cross-flow CO2 laser. If there are mirrors in the beam path between the resonator mirrors, the laser is said to have a folded resonator. This configuration produces a more compact beam source and achieves a definite polarization. The following rule should be observed when designing a CO2 laser: The larger the beam diameter, the lower the thermal stress on the optical system. This results in longer lifetimes. Use as few mirrors as possible in the resonator because simpler designs lower investment, operating and service costs. CO2 lasers in which the gas flows perpendicular to the resonator axis are described as cross-flow lasers. In this design, a relatively slow gas flow carries the heat away from the large discharge cavity. The optical power can be generated only between two fold mirrors in a multiple folded resonator. Thus, reasonably priced compact high-power lasers, whose beam power and beam quality (multimode, K > 0.14) is ideal for most welding applications, can be produced in this manner. • The laser gas circulation system uses no quartz glass tubes, which usually have to be replaced every 8000 to 10,000 hours. • Operating costs are low compared with axial-flow lasers of similar output power because of low energy and gas consumption. • Their simple design contains only a few components subject to wear. In addition, the low-speed tangential blowers ensure good reliability, which is important on automated production lines. Most CO2 lasers employ the fast axial-flow principle because it provides the necessary beam quality for the majority of cutting applications. In this technique, discharge occurs in a tube through which a gas mixture flows at high speed, thus ensuring effective heat removal. To achieve this high flow, roots blowers, radial blowers or turbines usually are used. Figure 3 shows that several functional segments can be connected optically in a series to increase the power in the resonator, while at the same time maintaining the design features of the individual segments (i.e., discharge stability and flow conditions). In this way, lasers with the same basic elements can be assembled for different beam powers. Figure 3. Fast axial-flow CO2 laser. In building fast axial-flow high-power CO2 lasers at Rofin-Sinar, our aim was to keep the design of the resonator simple with a low number of mirrors and optics, and to achieve 45° polarization (via a patented resonator construction). The resonator is optically stable, resulting in the absence of diffraction losses (up to 20 kW). Fast axial-flow CO2 lasers with beam output powers ranging from a few hundred watts to more than 20 kW are possible. 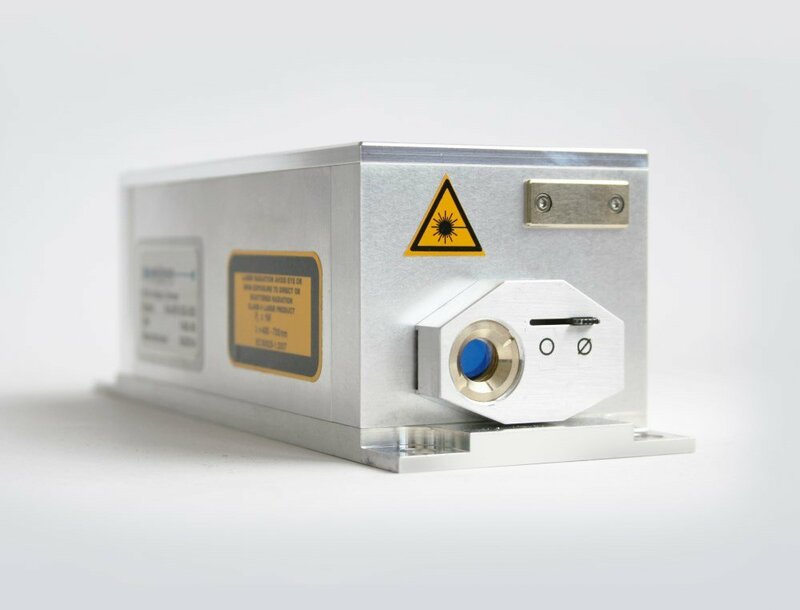 A typical feature of almost all fast axial-flow lasers is the separation of the control unit and laser head, the latter containing the components necessary for beam production, gas circulation and cooling. In the first CO2 lasers, the gas mixture was enclosed in a discharge tube. Despite efficient cooling of the external tube wall, only about 50 W of beam power per meter of tube length could be produced. This inhibited construction of compact high-power lasers. Figure 4. Diffusion-cooled CO2 laser. 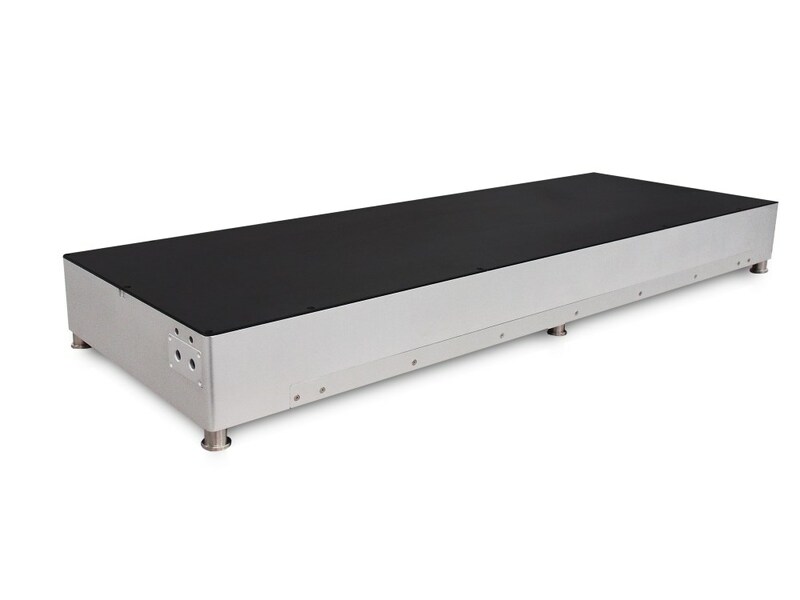 By comparison with modern fast-flow lasers, the slab laser is extremely compact. In these lasers, which are available with powers from 1 to 8 kW, an RF gas discharge takes place between two copper electrodes with large surface areas. The small gap between the electrodes allows maximum heat dissipation from the discharge cavity via the water-cooled electrodes, producing a comparatively high power density. The unstable resonator uses cylindrical mirrors and produces a highly focusable beam. In external, water-cooled, reflective beam-shaping components, a rectangular beam is transformed into a rotationally symmetrical beam with a beam quality of K > 0.9. Another significant advantage of this laser is the virtually negligible gas consumption. In contrast to flowing gas lasers, fresh laser gas needs to be added only at certain intervals. A small 10-liter cylinder containing the gas mixture is located in the laser head and lasts for more than a year, eliminating the need for an external gas supply and the logistics for the permanent exchange of cylinders. The smaller laser head simplifies integration into processing machines and makes systems with a movable head possible. For large gantries, as found in ship or plant construction, the best beam quality can be assured over the entire working area. This is of special significance in cutting applications. The main advantages of this technology are: very compact and nearly wear-free construction; high beam quality; no gas heat exchanger required; low optical loss; very high thermal stability; low gas consumption and no external gas cylinders necessary; no gas flow and therefore no contamination of the resonator optics; and low maintenance. Sealed CO2 slab lasers are based on exactly the same technology. They are all hard sealed, which leads to lifetimes between gas changes of more than 20,000 operational hours. Such lasers are used mainly for cutting textiles, glass and ceramics in the output power range from 25 to 600 W.
A wide variety of laser technologies and systems provide solutions for a large number of industrial production tasks. This complexity, combined with knowledge of the advantages and disadvantages of all solutions, provides the basis for the configuration of the optimum solution for each specific application. The first consideration should be the technical criteria that are important for the required production quality and productivity. Technically suitable systems can then be assessed according to economic criteria to find the optimum laser system for the application. With this assessment, a company can, apart from implementing the desired product and production innovations, reduce investment, operating and service costs. I would be interested in more information on laser used in medical applications such as Grotrian scheme with electronic levels involved in different transitions. I am a Lecturer PhD and I need some more basic info on lasers and how they are constructed. If anybody could help me with some sites I would be really happy to have them.